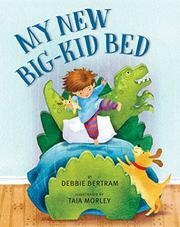 Fears of a new bed can be complicated when a dinosaur’s added to the mix. The light-skinned child narrator at the heart of this rhyming text is thrilled to pieces by a new big-kid bed with a dino-shaped headboard, received as a birthday present. Eager and excited to use it, at last the child is tucked in nice and snug. But what’s this? The moonlight casts a scary dino shadow on the wall, and suddenly this bed is the last place the tot wants to be. Trying to bunk with Rover, Grandma, and then Mom and Dad doesn’t help—it’s impossible to get to sleep. All ends happily when the kid finally returns to bed to find that the moon has gone away, taking the shadow with it. What precise fears are meant to be allayed here is unclear. While many kids can identify with the nervousness of transferring to a “big-kid bed” (falling out, getting lost in it, the height, etc. ), few will be facing the additional phobia of dinosaur-headboard shadows. Why compound fears of bedtime unnecessarily? Additionally, since the moon’s movements erase the problem independently, the protagonist doesn’t even psychologically work through the fear. To accompany the jaunty rhymes, Morley’s upbeat art aims for jolly rather than scary. The endpapers hint that the child’s shadow possibly cavorts with the dinosaur’s, though this remains unclear.